The current plan calls for the center to be situated on a large plot of land in Jackson Park. A lawsuit filed by the environmental advocacy group Protect Our Parks (POP) has gained unexpected traction in its effort to block the arrival of the Obama Presidential Center (OPC) in Jackson Park. Although the suit was not expected to seriously impact proceedings, a flurry of amici curiae (friends of the court) briefs and two ruling delays, most recently on February 14, have raised the question of whether the lawsuit will alter the current course of the OPC. The City approved the OPC’s proposal in May 2018. Opponents of the suit claim that it is meant to sabotage a positive economic and social force’s landing on the South Side. More than 200 University professors have signed onto a letter arguing that the OPC would be better located in Washington Park. Several, including English professor W. J. T. Mitchell and law professor Richard Epstein, have authored separate documents outlining their reasons for opposing the OPC’s Jackson Park location. Other University faculty, including biochemistry professor Erin Adams, voiced support for the OPC’s proposed location in a letter to the editor of the Hyde Park Herald. Adams signed the letter as a co-founder and chair of South Side Neighbors for Hope, a local pro–OPC organization. The crux of the lawsuit’s argument is whether the value of the OPC will compensate for the value of the 19.3 acres of public land Chicago would allot to the Obama Foundation in exchange for ownership of the complex once building is finished. According to the Tribune, most Chicagoans believe it would benefit the area by attracting commercial opportunities and increasing the number of visitors. For opponents of a Jackson Park Obama Center, the lawsuit may bring them the outcome they desire, though perhaps not in the manner they expect. Although Judge Robert Blakey said that he does not wish to extend or delay his ruling on the lawsuit, an expected ruling was pushed back from February 14 to February 19. Previously, the ruling date had been set for February 9. The legal process surrounding the suit recalls another public-lands dispute over the George Lucas Museum, which was preparing to build on Lake Michigan in 2016. However, due to delays and legal wrangling the litigation caused, the museum relocated to Los Angeles. That lawsuit, brought by Friends of the Parks, had a similar argument to that filed by POP—namely, that the project would encroach on laws protecting the lakeside parks. Residents who support the OPC fear that the drawn-out court battles will deter the Obama Foundation from breaking ground on the project. “The [Obama Foundation] may only be willing to fight for this for so long. Then we’re back to where we were—begging businesses to come to our community,” South Shore resident Paraisia Winston told the Tribune. Proponents of the OPC’s arrival in Jackson Park have filed opposing amicus briefs; these proponents include Chicago’s Museums in the Park, several other presidential libraries, and a group of seven property law professors from UChicago and Northwestern University, among other institutions. In Epstein’s amicus brief opposing OPC’s Jackson Park location, he argues that the OPC does not stand to add as much value to Jackson Park and surrounding neighborhoods as it advertises. “They never established that the project, which is rife with conflicts of interest, supplies a fair value in exchange to the City,” he wrote. Among the expenses that the OPC would create for the city are the cost of added infrastructure to the park and inconvenience to commuters. In order to accommodate the OPC, the city would need to overhaul two main traffic arteries, Cornell and Stony Island Avenues. Specifically, Adams said in an e-mail to The Maroon that while Jackson Park Watch, a local organization promoting community engagement with decisions involving the park, claims that the OPC will be situated on land that was never developed, this is not the case—the OPC will stand where the Horticulture Building of the 1893 World’s Fair once stood. Adams pointed to a photo of the World’s Fair as evidence. While organizations like The Cultural Landscape Foundation (TCLF) and POP believe that the allocation of the 19.3 acres will ideologically charge the previously neutral park space, Adams and South Side Neighbors for Hope see the OPC as the latest installment in the park’s mandate of public enrichment. 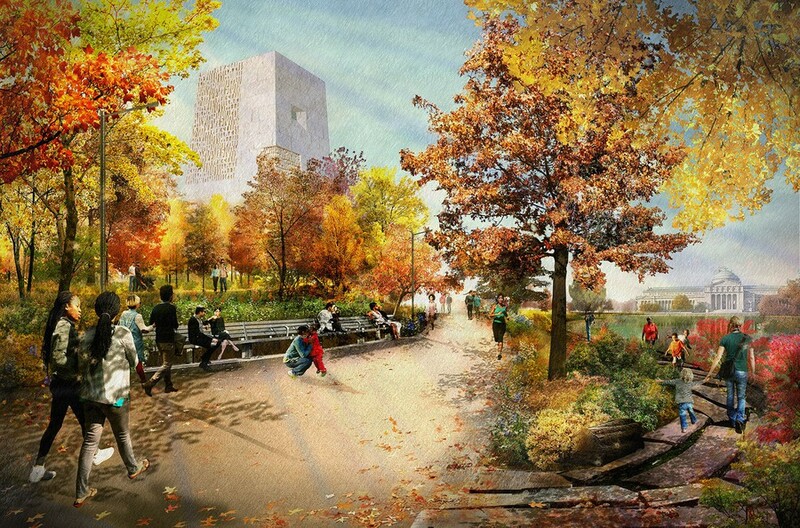 Adams responded that the OPC will instead further Olmsted’s idea of the park. It could even support Olmsted’s vision through features like a sledding hill and pedestrian paths. “The original concepts of democratic access, education, and operation for the public good that characterize Chicago’s Museums in the Parks were founded in Olmsted’s World’s Fair vision. The OPC is a significant addition to this 125-year tradition,” Adams wrote. The suit, initially expected to be thrown out, has now gained both ardent support and dissent from University faculty.